Jetters are masters of declogging; with a powerful blast of water from its pump, jetters can dislodge solid debris clogging vital pipes and sewer lines. As solid waste going down the drain is a common sight in many homes and office buildings, jetters can unclog a pipe faster than most conventional solutions. 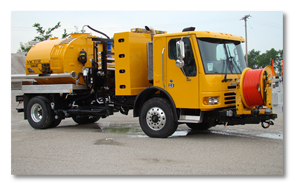 As a leading supplier of sewer cleaning equipment, Haaker Equipment Company offers powerful jetters for use by local utility services. Haaker Equipment is a certified dealer of the Vactor Ramjet, Vactor Manufacturing’s primary and only jetting model. The Ramjet is a jetter that’s synonymous with heavy-duty jetting with low water consumption, ideal for users looking to unclog pipes efficiently. The Ramjet can deliver three ranges of water flows—60, 65, and 80 gallons per minute—depending on the nature of the clogging problem. The Ramjet can carry up to 2,000 gallons of water in its tank. The water is delivered along an 800-foot hose that is designed to handle the tremendous pressure associated with jetting (600 feet for front-mounted reel). The long hose allows workers to work deeper into the sewage system and unclog any clogged pipes. Mounted on a small truck, the Ramjet can be positioned anywhere with relative ease for on-the-go declogging work. Basic water pressure for the Ramjet is rated at 2,000 psi, but that can be increased with a Ramjet Rodder Pump. The Rodder Pump is a single-piston, dual-action water pump that delivers water like a jackhammer, increasing water pressure up to 2,500 psi. The Rodder Pump requires only five moving parts and is driven hydraulically. Its simple design keeps the cost of repair and maintenance at a minimum. Overall, the Vactor Ramjet from Haaker Equipment Company is everything you’ll need to get rid of even the toughest clogs. With its powerful pump and mobility, pipes across cities and towns can be kept clean. The Vactor Ramjet jetter series are the perfect machines for fast, safe response to sewer blockages as well as regular preventative line maintenance. The line of reliable, high-pressure water jetters are specially designed for cleaning municipal sewer, drain and pipelines and culverts. 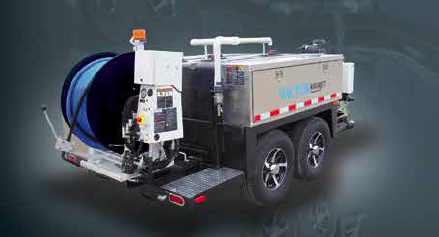 Vactor offers a full line of trailer and skid-mounted jetters available with a variety of engine and pump configurations, water tanks up to 1000 gallons, and a wide range of optional equipment. The Ramjet units are designed to provide high pressure at low water volume and are ideal for cost-effective maintenance and emergency response in tight, confined environments.